A one-year-old boy from Aztec, New Mexico, is recovering from a stroke allegedly caused by his abusive father. Quentin Mitchell, 35, of Aztec, was arrested on two first-degree felony counts of abuse of a child resulting in great bodily harm on Aug. 31. 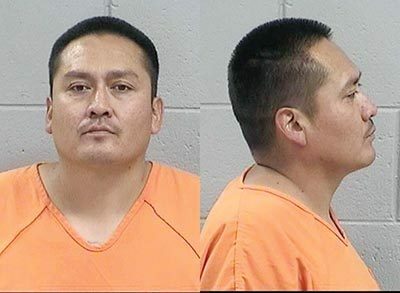 San Juan County Sheriff’s detectives were called on July 27 to investigate a possible child abuse incident after doctors questioned the parents’ account of the baby falling off two-foot-high bed onto a carpeted bedroom floor. The mother of the baby told police she found her son on the floor. When she picked him, he was “unresponsive” and was “stiff” and “his eyes were looking at opposite directions.” The baby was taken to the San Juan Regional Medical Center in Farmington. Doctors caring for the baby told police they found the baby was suffering from a number of injuries, including a skull fracture, a spinal injury, and multiple brain bleeds. He was flown to the Denver Children’s Hospital where they found the child had suffered a stroke and had to perform surgery to release pressure on his brain. There, doctors specializing in child abuse cases determined the injuries were not consistent with a simple fall from a bed because the brain bleed and spine injury were caused by “sudden acceleration and deceleration like shaking and/or slam.” Doctors confirmed the injuries were from multiple incidents. Sheriff’s detectives interviewed the mother, who they say eventually confessed Mitchell had been abusive towards her and her son. During the investigation, the mother shared a string of text messages, in which Mitchell allegedly wrote to the mother that she “got the cops involved. Now they’re investigating” and said the baby was “fine” and she had “overreacted.” When the mother asked Mitchell to support their son, he responded with “your crazy” and said that it was his “cue to leave” her. Jayme Harcrow, public information officer with the San Juan County Sheriff’s Office, said in an email the baby would most likely have permanent brain damage. Mitchell is being held at the San Juan County Detention Center and has a preliminary hearing this morning at the Aztec District Court. The infant is in state custody.